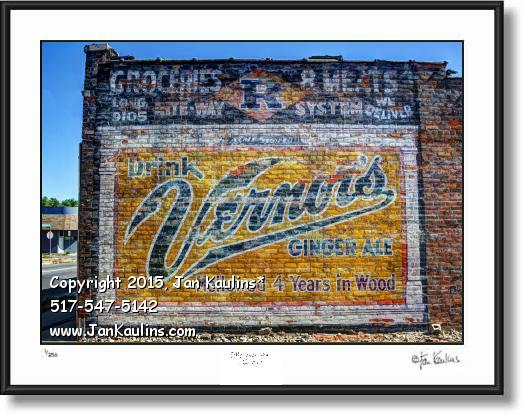 OLD VERNORS GINGER ALE mural photo picture print photograph for sale. VERNOR'S GINGER ALE Detroit ghost sign mural advertisement on old building billboard photography picture print poster art photo for sale. VINTAGE VERNORS SIGN photo picture art prints for sale. This vintage old Detroit Vernor's Ginger Ale advertising mural sign was discovered on the side of an old building on the west side of Detroit. The adjacent building had just been torn down exposing this wonderful 'time capsule' OLD VERNOR'S GINGER ALE advertising mural on the side of the brick building. The building it was painted on was built in 1928, at which time it was a local grocery store and meat market, so the mural probably dates pretty close to that time. Vernor's Ginger Ale is THE Original Detroit pop, dating back to the Civil War era. This MULTIPLE EXPOSURE artistic original signed and numbered Limited Edition photo is made using nine separate bracketed exposures which then are layered and artistically interpreted to create this original photographic work of art. This is an original High Dynamic Range color photograph created by nationally recognized artist/photographer Jan Kaulins. It is one of the newest artistic images in his most recent series of photographs. Each photograph has been created from nine separate photographic digital exposures and then layered together into one photographic image. It is then ‘tone-mapped’ where individual areas of the photo, as well as contrast, saturation and other qualities of the image can be artistically manipulated to bring out the artistic effects that make these photos so visually unique. Some of the photos in this series are even further enhanced for artistic effect giving them an almost painterly or graphic silkscreened look. They do not look like your grandmothers traditional photos.